i have had the most hectic few weeks in a long time…..sometimes barely being able to meet deadlines and other commitments…..its been a roller coaster….and now that its over….i miss it all!! i miss my momma!! one of the nicest things about having your mother around is all the food…cooked and served up!! plus there is all the shopping and the talking that goes on without a break!! with the summers here and my attempt to try and eat what is seasonal (but that is an oxymoron these days!! strawberries in the summer and mangoes in sept!!) i find myself making this chutney a couple of times a week atleast while raw mangoes are still available…..it puts a twist on our favourite idli and dosai accompaniment of fresh coconut chutney and gives it quite a flavour kick!! even k who isnt particulary fond of sour stuff was seen reaching for refills…..tangy, spicy and just the right dose of colour, green mango and coconut chutney is my entry to WBB#22 – May Mango Madness that has come to perch at Escapades for thi s edition after spreading its wings from Saffron Trails where its genesis lies. in a blender jar, add all the ingredients for chutney and pulse (not continuously) till smooth. check for seasonings, adjust and take out into a serving bowl. heat the oil in a small pan, add the mustard seeds, when they begin to splutter, add the rest of the ingredients and toast on a medium flame till they are beginning to brown. pour over the chutney. mix and serve with idlies or dosai. Mango chutnye looks yummy, we make this a little thicker and usually eat it with rice, any pachadi we eat with rice! 🙂 Will have to try it with dosa. Dear MM, thanks for reading (and enjoying!! really??) my ranting!! oh yeah i miss her sooooooooo much…..infact almost opened the floodgates on both sides of the phone line just now!! 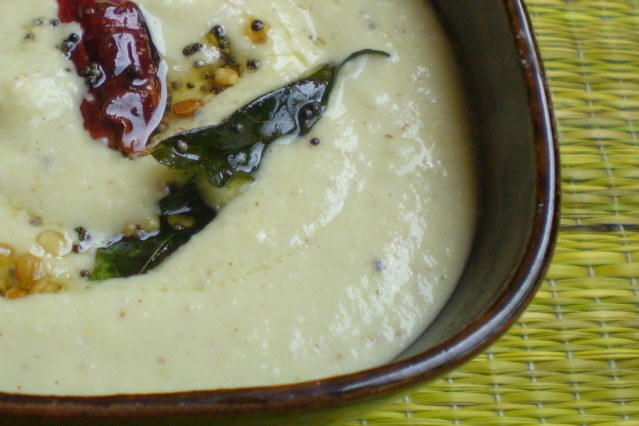 this chutney we have with pongal or khichdi too and it tastes divine!! 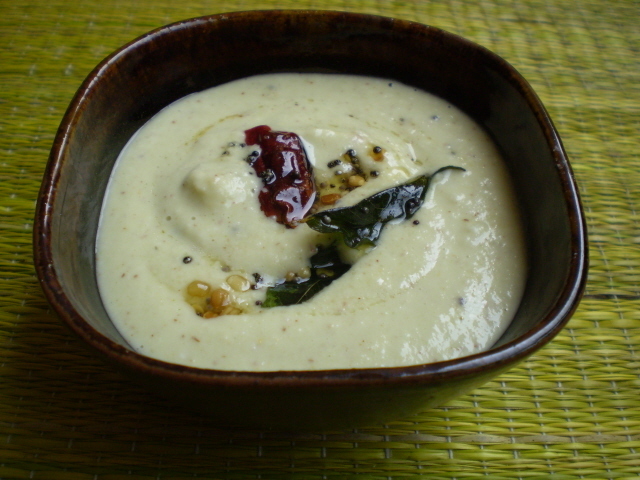 gr8 combination,mango chutney looks nice.Would love to see u on my blog. thanks hetal…heading over to your right after i save this!! Absolutely love this. 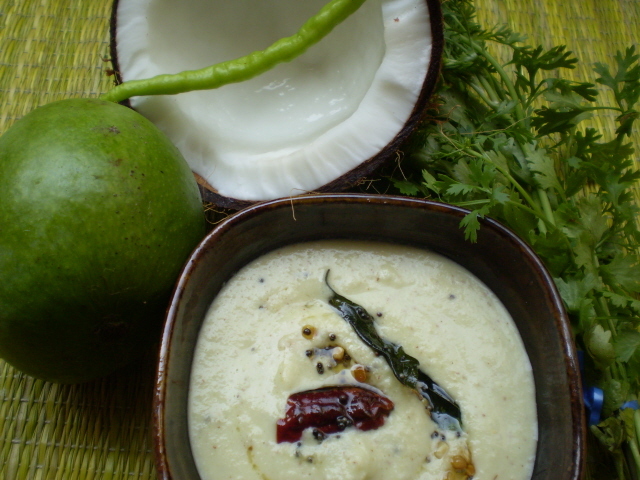 We also make a “thogayal”/ “chammandi” (thick coconut chutney like this. Heavenly. oh i have had thogayal with green mango at a friends place, it was awesome!! have never tried making it myself….must try!! so green mango instead of tamarind… nice idea… have 2 raw mangoes at home. the bowl looks yummy arundati! Just when I was getting tired of the usual coconut chutneys, you came up with this…can’t wait to try it out! Green mango chutney is my favorite chutney in the world, we make it thicker, and have it with rice normally… But I can see how it works with dosa or idly. Yummy! My entry is also a raw mango chutney but different from this…will post soon 🙂 haven’t tasted this with coconuts, will be a nice twist!